We had a long cherished dream of having a rendezvous with Akbar’s Tomb…one of our country’s precious architectural marvels. 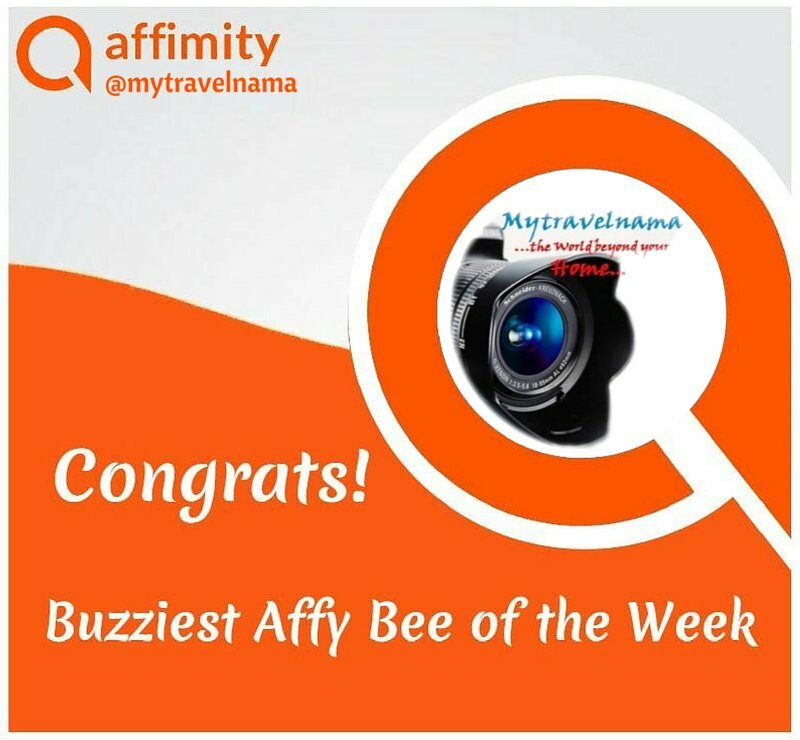 The opportunity came during our prized winter vacation in Agra. We were returning from the Mariam’s Tomb towards Agra city taking the Agra Delhi Highway (NH2). Our journey was fairly quick, we had to turn around and just get into the other lane of NH 2 leading to Agra City and Akbar’s tomb was in full view within just a few minutes to our left. After parking our cab in the allotted parking space and completing our entrance fee formalities we strolled towards the south gate of the tomb. The walkaway was surrounded by large trees. There was one tree full of squirrels. Many of the visitors were enjoying feeding them with fried groundnuts and chana. The little squirrels were more than happy to acknowledge such hospitality. Our attention was drawn towards a black marble plaque located in front of the entrance of the south gate. It was a brief historical perspective written on the great emperor. We could not help ourselves from thoroughly enjoying the facts presented for the visitors. Abul Fateh Jalaluddin Muhammad Akbar (1555–1605), the greatest of the Mughals, had been a true inspiration for our tour to Agra. The aura of his monumental contribution in the growth and development of Mughal empire in terms of establishing political control, mastering in the fields of art and culture, architecture, socio-economic development, administrative reforms and religious tolerance & harmony across the then Hindustan was enormous in terms of shaping the course of history and laying the foundation for modern India. His popularity and contribution as a leader in every domain of living is considered to be relevant even beyond the Mughal era. It was our long cherished wish to pay homage and respect to the great leader, which would not have been possible if we haven’t had visited his tomb at Sikandra (Sikandra got its name in the memory of the Delhi Sultan Sikander Lodi who ruled in between the years 1488 to 1517). Akbar’s tomb was built during 1605-1613 at Sikandra, located in the outskirts of Agra city on the Agra-Delhi National Highway (NH 2). The tomb bears the display of another splendid Mughal architectural mastery that started during the reign of emperor Akbar. Apart from the great emperor himself, the tomb is also the resting place of his daughters, Shakrul Nisha Begum and Aram Bano, Zebu-n-nisa, daughter of Aurangzeb and Sulaiman Shikoh, son of Shah Alam. 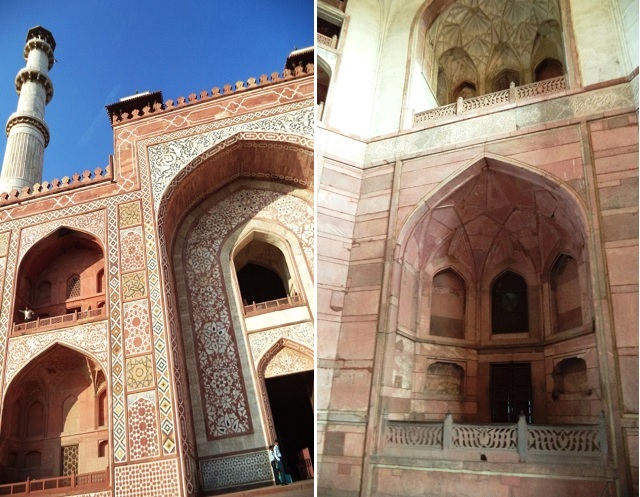 Unlike the all white marble Shah Jahani monuments and buildings, the tomb of Akbar is built by red sandstone with white marbles used on the red sandstone base creating borders and exquisite floral and abstract designs. 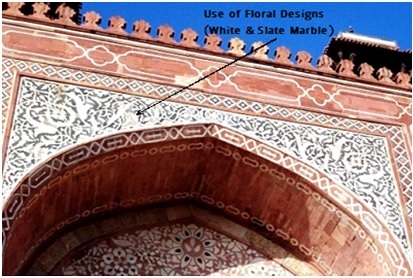 The tomb also displays the use of elongated corner white marble minarets or towers in this main South Gate entrance that we find in the Taj Mahal. The tomb site also features the “Kanch Mahal” (Glass Palace) made by emperor Jahangir built as a guest house during his hunting expeditions at Sikandra. During Akbar’s rule from 1556 to 1605, the Mughal empire had witnessed economic growth and development. It was an era marking excellence in administration, military affairs, socio-economic growth and development. The era also marked tremendous growth in the practice of arts, culture, trade & commerce, science, medicine, engineering, architecture, philosophy, and socio-cultural as well religious integration. The emperor himself emphasized on building cordial and peaceful relations with neighboring states and nations by giving importance to flourish trade and commerce and exchange art, culture and traditions that ignited holistic development in the empire. His political and administrative system was the pillar of the future Mughal dynasty by bringing in inter-culture and religious tolerance, harmony and co-existence. Such achievements earned him the title “Akbar-the-Great”, the leader beyond time, whose philosophies are relevant even in the modern era. 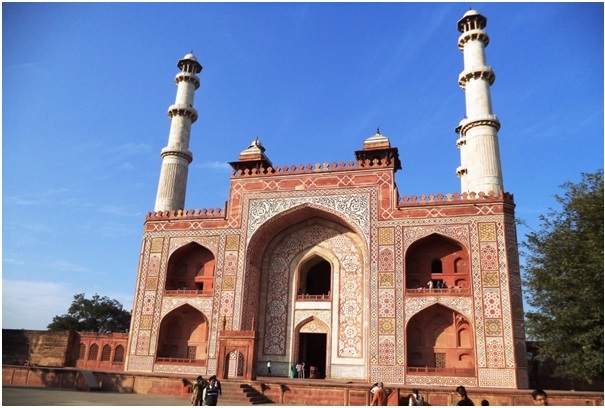 It is said that the emperor Akbar himself took up the project of constructing his own mausoleum (Tartary custom) in the year 1600 at a site near to the Southern banks of the Yamuna what we know today as the modern day Sikandra. The tomb site was initially planned by Akbar with a huge garden surrounded by red sandstone walls with the centrally located four monumental gates. Of these the south gate is the most important among others and forms the main entrance to the tomb. 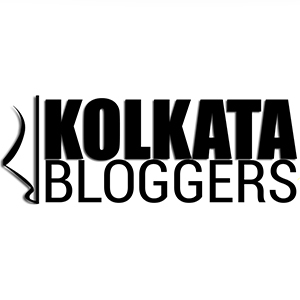 The tomb site was known as “Bihistabad” or the “Heavenly Abode”. Although the emperor took the project of building his own tomb he could not complete the same due to political unrest created in the empire by his rebel son, prince Salim, who was later coroneted as the fourth Mughal emperor Jahangir. Akbar left the designs of his tomb through models and detailed design plans, which were used by emperor Jahangir for finishing his tomb in 1613. Akbar’s designs and models (particularly with reference to use of marble “Jalika” on windows, knowledge about Pietra Dura designs on white marble) later became the inspiration for his daughter-in-law, empress Noor Jahan (Jahangir’s wife) who used the same for her father’s tomb – the “Jewel Box” tomb of Itimad-ud-Daulah. Probably this was also an inspiration for his grandson Shah Jahan under whose rule the Mughal dynasty witnessed the grandeur of white marble mansions, palaces and monuments. 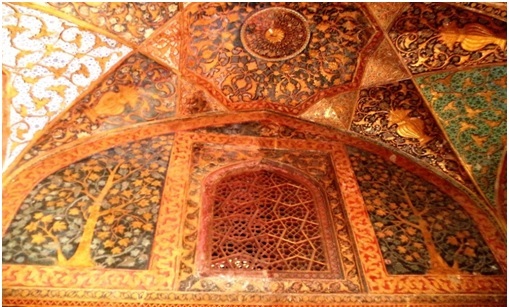 Restoration and conservation of Akbar’s tomb as one the important “Heritage Sites” had been done with great success by the Archaeological Survey of India. While moving to Agra on road by the NH 2, the South Gate presents a majestic view of the by-gone glory of the great Mughals. The entire tomb complex is constructed over a red sandstone high-walled garden which centrally harbours the main tomb monument. The surrounding walls consist of four gates, out of which the South Gate forms the most important as well as the main entrance to the tomb complex. 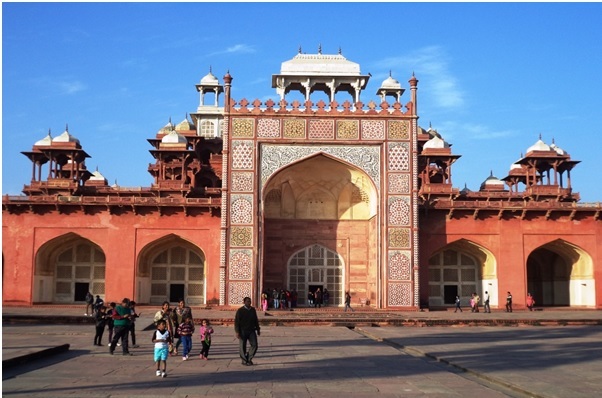 The south gate of Akbar’s tomb is a majestic deep red sandstone monument of its kind. The mansion is the largest among all the other three gates. The glamour quotient of the building is further enhanced by the four all white chhatri capped elongated minarets or towers. 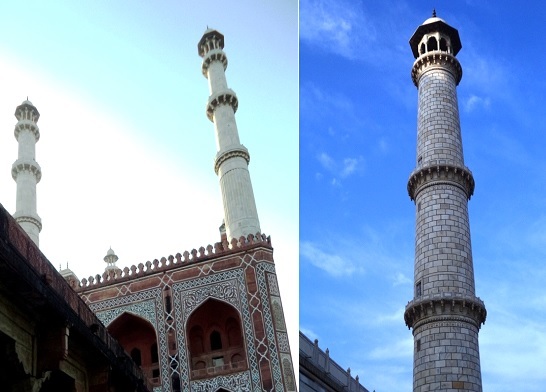 Similar towers were later used by Shah Jahan in the Taj Mahal. The peculiarity of the beauty of this monument lies in the exquisite use of white marble on deep red sandstone base in the form of borders and floral, as well as abstract designs. 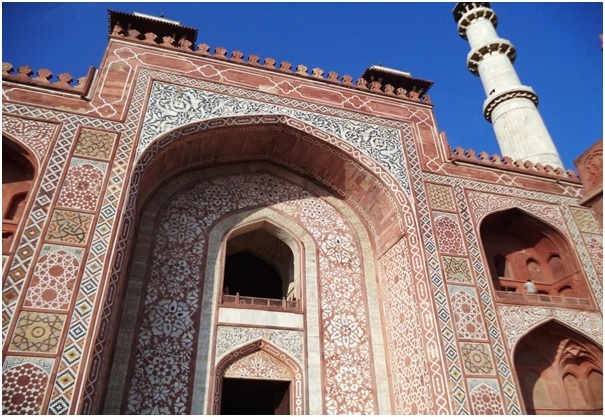 Careful observation of the South Gate also reveals the detailed use calligraphic designs in the form of large mosaic patterns brought in by the use of white marble and slate coloured marbles. Some designs reflect the use of floral patterns whereas in other places emphasis is given on the use of abstract and geometric figures. The beauty of the south gate entrance is further enhanced by the large central arch which is flanked by other smaller and simpler arches located at its ground and first floors. The inside of the South Gate reveals a large central hall leading to the garden and the main tomb building. The hall consists of arched chambers or pavilions located in the ground floor as well as those overlying in the forms of verandahs in the first floor. The selective use of white marble on the galleries in the first floor and red sandstone in those on the ground floor gives the monument a majestic look. On the overall the architectural pattern of the South Gate and other gates bear the features of using an admixture of the traditional Hindu, Muslim, and Christian styles and designs which was the hallmark of the typical Akbari architectural achievements. The four white marble minarets of the South Gate bear unique resemblance with those that were later built by Shah Jahan at the Taj Mahal. 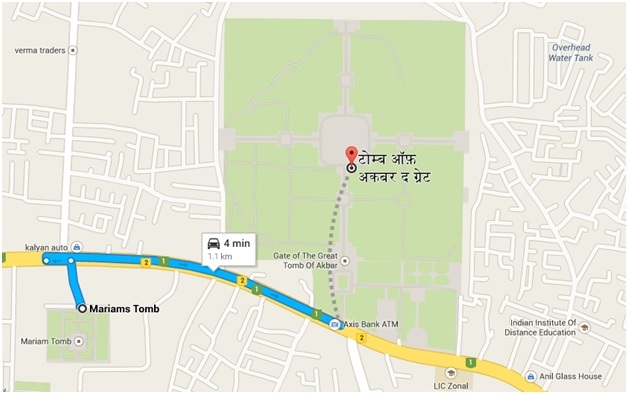 The central pyramidal tomb of Akbar is surrounded by a lush green “charbagh” garden. The garden harbours beautiful palm trees with a central pathway paved with deep red sandstone leading to the central tomb from the south gate entrance. The emperor’s tomb is located centrally at the junction of the four pathways (meeting from the four gates) dividing the garden into four square-like sections. Recently the Archaeological Survey of India had opened an open deer park in the garden for visitors and tourists. The main monument of Akbar’s tomb is pyramidal in shape consisting of five storeys built over a wide square-shaped ground floor burial complex. It is said that emperor Akbar could partially complete the red sandstone tomb complex that we can see at the basement and which is contains the main burial chamber for the emperor and his daughters. The storeys above the burial complex feature arcaded verandahs containing arcades and cluster of twenty three chhatris located on all sides. Some of the chhatris located at the first floor of the tomb have pyramidal roofs or chhaparkhat made of white marble and glazed tiles. The second and third floors are made up of a series of similar small cubical rooms. The top most floor is entirely made of white marble with pyramidal cenotaph. The cenotaph on the apex of the tomb displays unique carved structural patterns with arabesque and floral designs on them. The walls below the cenotaph are made of delicate marble screens or jalikas. 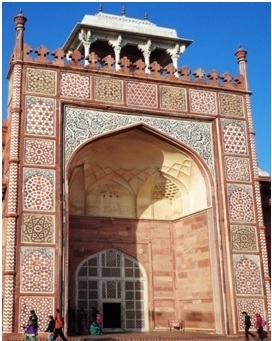 The square shaped front entrance is the most attractive part of the main tomb. It displays the best of Akbari sculpture and archaeologically advanced artistic designs similar to what we find at the South Gate entrance. All these designs are made with white marble on red sandstone base. 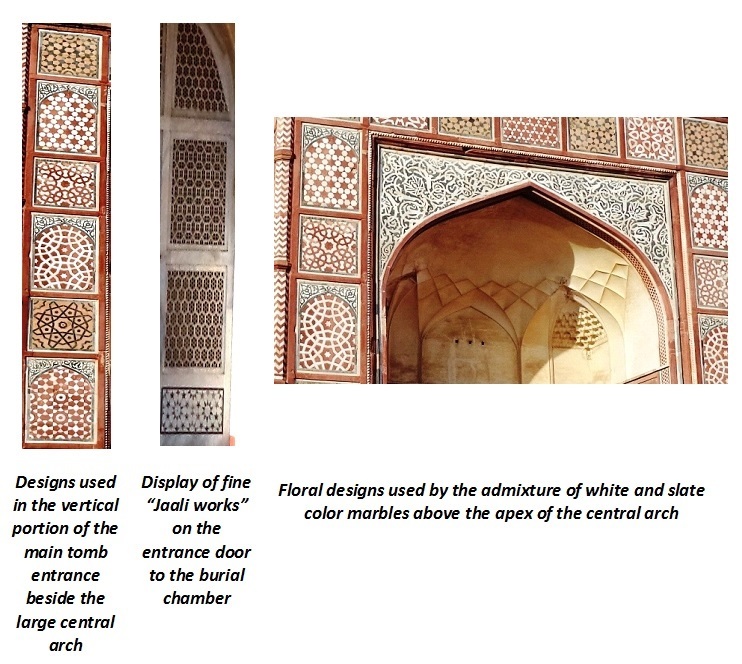 The designs include the use of complex geometrical and abstract patterns in both the top horizontal as well as the vertical portions of above and beside the main central arch leading to the entry of the tomb. Such designs were created by the use of glazed-tile mosaics or of multi-coloured stones textured on red sandstone base (Akbari Pietra Dura?). In case of the portions above central arch, we find the exquisite use of white and slate coloured marbles creating out of the world floral designs just above the apex of the large central arch leading to entrance of the burial chamber. While approaching the inside chamber of the tomb from the exterior gateway, one can see the intricate display of pure white marble “jaali works” which Akbar had proudly showcased in the tomb of Salim-Chisti at Fatehpur Sikri. Later on, Akbar’s grandson and the fifth Mughal emperor Shah Jahan used this fine art abundantly in majority of his white marble palaces, and world famous monuments including the Taj Mahal. While entering the interior of the tomb (entrance to the basement burial site) we were led to a small hall which exhibits the remnants of a magnificently painted (stucco paintings) dome. These stucco paintings create an out of the world aura by the use of gold, blue, and green coloured floral arabesque amidst Persian inscriptions. It is said that emperor Jahangir had once decorated this chamber abundantly by precious stones which are no longer seen today. A centrally located doorway leads to a tunnel like pathway entering the basement burial chamber containing the sarcophagus of the emperor. The burial chamber is very simple, pale cream coloured without any designs or paintings which we find at entrance chamber. Unlike Shah Jahan’s white marble sarcophagus bearing the finest exhibition of Pietra Dura at the Taj Mahal, the all-white marble sarcophagus of Akbar is perhaps the symbol of simplicity, purity, dedication and self-actualization. In the end while exiting the tomb in the fading evening light, we realized that Akbar-the-great might have been rested in peace long back, but he still lived in billions of Indian hearts by the might of his works, his passionate creativity, exuberance and youthful enthusiasm, unflinching political principles, immortal philosophies for harnessing religious harmony and social integration and would continue to inspire many a soul in days to come. Akbar’s unflinching principles of love and harmony haunted and hummed in our mind. We realized the funny event at the entrance might not be funny for the guys who wanted to take us into the tomb. Perhaps there was a place of deep respect for the great emperor in the back of their mind. Akbar was an idol for them too. For them, livelihood through tourism was their only means of sustenance. 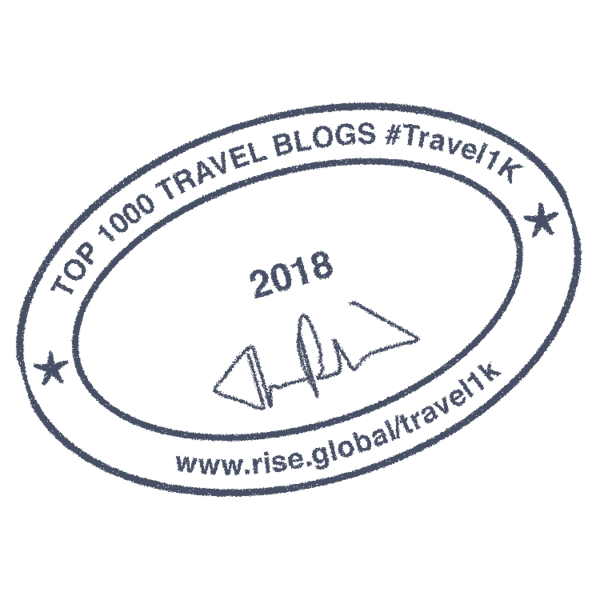 While many worked in the hotels and government recognized tourist organizations, majority of the others had to depend on freelancing and standalone businesses related to tourism. 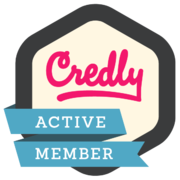 We felt sorry we could not contribute to the earning of all. It was a pity to just call them off. It could have even happened to Salim whom we had liked so much. While going back we had a chance to meet a few of them. Now many of them were selling collection of colourful post cards and mini guide-books; while others were offering to take instant photographs of any visitor in front of the South Gate. Some of their post card albums were of high quality. Before leaving for Tajganj we could not restrict ourselves from purchasing one such beautiful post card album. 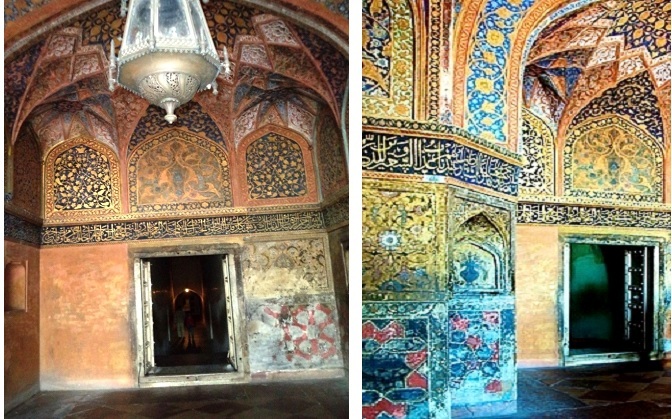 Very nice detailed description of Akbar’s tomb. Marble carving and calligraphy on red sandstone and stucco on ceiling are beautiful and interesting to see.